Beam me up, Scotty! Or wait, let’s re-think this because this isn’t technically Star Trek. However, this new show from Fox totally gives us the Star Trek vibes, and we love it. 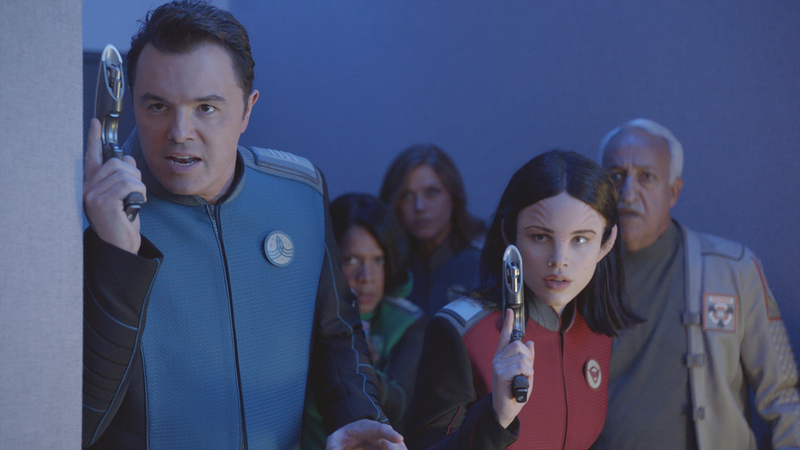 The Orville is a new sci-fi show from Seth MacFarlane that is totally the science fiction show we need in our lives right now. And, if you love Star Trek (ahem, or even the cult-classic, Galaxy Quest), then you’ll probably notice a few similarities in The Orville when it shows up on Fox this Fall. I mean, just look at it! "The Orville is a one-hour science fiction series set 400 years in the future that follows the adventures of the U.S.S. Orville, a mid-level exploratory vessel. Its crew, both human and alien, faces the wonders and dangers of outer space, while also dealing with the familiar, often humorous problems of regular people in a workplace…even though some of those people are from other planets, and the workplace is a faster-than-light spaceship." Ouch! Created by Seth MacFarlane (you know, the one that created Family Guy! ), the show also stars Adrianne Palicki, Scott Grimes, Penny Johnson Jerald, the hilarious Norm Macdonald (who voices that blob above), and many more. There’s no specific premiere date for The Orville yet, but it will begin airing this Fall on Fox. Man your stations, this is gonna be an interesting ride.